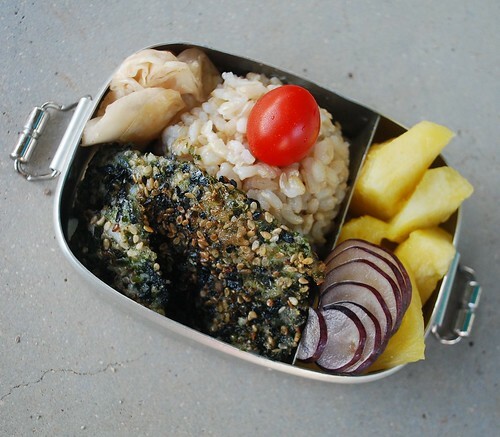 Furikake Mahi Mahi Bento, originally uploaded by sherimiya ♥. We're still in Hawaii on vacation, and that is my excuse for another ready-made bento. I love furikake mahi mahi. You have to use lots of mayonnaise to get the furikake to stick while you cook the fish, and so it's not super healthy. Plus, I can't ever get it to cook without burning. But it's very yummy! I got this one from Loco Moco. Have you been eating healthy over the holidays? I am definitely eating more than usual, and more sweets than usual too. I know the new year has nearly started (a few more hours here), but I will go back to cooking healthy bento as soon as we get back! Til then, maybe this one and another local grinds bento to fill in the blog? Sheri, furikake mahi mahi looks very interesting for me. Wish you & family once again ... Happy New Year!! Hi Lia! You still checking blogs? I am very behind in mine! Have to get back out of vacation mode pretty soon.. :) Thanks much for your nice wishes~! I hope you can be with your family again soon! Mmmmm, crunchy and salty are some of my favorite taste combinations! Lovely post, inspires to me get into a leaner post-holiday way of eating. Yay flavorful fish, veggies and fruit! 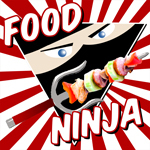 Ninja In The Fruit Bento!